The morning started off great. Breakfast at (ODT) o’dark thirty so we could be ready. We are the second flight out. The weather has been frightful the past few days from Katmandu to Lukla with Lukla being fogged/clouded/rained in more days since we started this trek than not. Yesterday as we headed up and down the 7,000 stairs to get back to lukla (ed. Just because you are desending 1,000 feet doesn’t mean that you go down 1,000 feet. On the Everest trail you go up 2,000 feet, down 700, then up 500, down 2,000, then up 1,500 and so on and so on and……whew…you can get exhausted just thinking about it). Each day I amateurishly estimate we have 20,000 feet of elevation change. Given my training maxed out at 12,000 and I thought I was a badass for that much, it was WELL beyond my comfort zone. I was pooped). 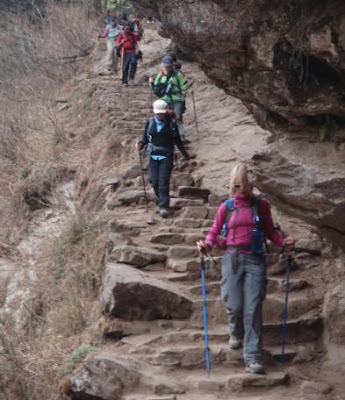 Coming into Lukla last eve it was near dusk and all we wanted was food and bed. All day long there was a constant train of people, porters and yaks all headed up the valley. Guess it was a good traffic day! So glad we are not part of that onslaught and that it was quiet for our trek. In the morning my stomach as in knots. Not nervousness, just totally sour. Something in last nights meal did not agree with me and I barely can sip a coca-cola. No matter, the sky starts clear and we are hopeful that second plane out is golden. 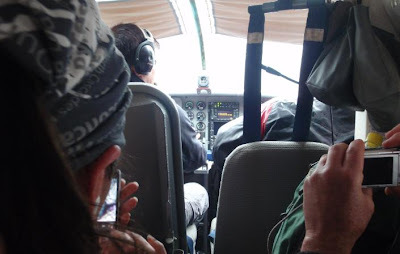 First plane leaves at 6am and hearing the roar of the twin otter sounded like freedom to us. Such a sweet sound. We are all packed, gear in bags and at the front gate with the porters ready to bring it to the airport entrance which you can see from the photo was right across the street. 8am, 9am, 10am and nothing. Not a good sign. Our Sherpa leader is pacing and tries to keep us all positive. I decide an extra nap is in order so read a bit on the kindle and fall asleep. Fast forward to 11am and I hear the roar of incoming planes. A troupe departs and heads up the trail but still no word of any outgoing traffic. We hear one plane roar down the runway and our Sherpa leader bolts into the airport and starts talking with key individuals. Politicking? Finding out what is going on? We don’t know. Now I am pacing. A lot! Those who know me know that is not a good sign. I have been kidding everyone about walking down the runway to the end and waving planes in. I am reminded that international incidents are to be avoided if at all possible. OK, OK…no fun this time…but tell me the visual isn’t hysterical! So we are all in the restaurant room, when suddenly the leader bursts in and says…we gotta go…now, hurry..but first..there will be two flights…the first can only take 5, who wants to go first. Without hesitation or any consideration of ladies first, my hand goes up and I say…I’m IN!!!! I jump up, grab my backpack and head out the door, Ang says goodbye to me, shakes my hand and wraps my neck in a prayer scarf. I smile and thank him for everything. Now he tells me to hurry…and as quickly as the next 4 choose to be the guinea pigs, we go into the airport. This is where it gets hairy. Many people (perhaps 100) are all crowded in the terminal and we are now RUNNING past them and towards security. A booking agent hands us boarding passes as fast as we can get them and down to security we go past the long line of people staring in absolute shock and awe. Security asks if I smoke, No I answer and he says, no lighters, no knives? Nope…safe here. He goes into my backpack and sees my 2 inch scissors. NOT ALLOWED, NOT ALLOWED he says. I say ok…no problem, keep the scissors. I don’t think he was prepared for my pre-emptive surrender of my gear to make the flight. He looks bewildered…I repeat..”no problem, keep them” and he says, “really?”….by then I have grabbed my backpack, run past security and am now stampeding down the jetway (if you can call it that). I get outside and the nice man with the automatic weapon directs me where to go with the barrel of his killing machine. I comply with a smile. We are now standing on the tarmac and there is a plane 50 feet in front of us with engines roaring, cargo bay open with baggage handlers frantically trying to dump all the contents onto the tarmac (forget a pallet, right on the tarmac). At this point I look up and realize that it is pouring rain, I can barely see the end of the runway and can’t see the mountains that I saw from our window this morning (see photos). Oh, oh….this really is serious I am saying to myself. Without warning and with the best image of the movie the “Killing fields” running across a war zone with full orchestra music in the background we are yelled at, quick, quick, run and follow me, hurry….hurry. We are now sprinting AROUND the airport. We run past the runway and down the hill (what…down the hill?) for probably a ¼ mile. 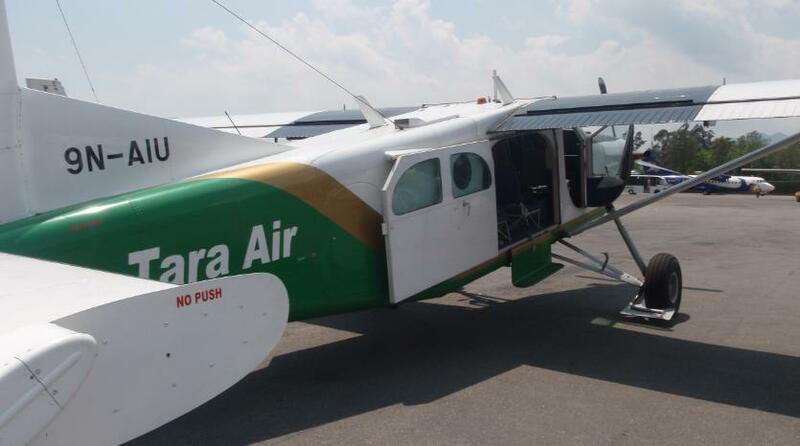 On the right off the tarmac are two ITTY BITTY (highly technical term) single engine planes. 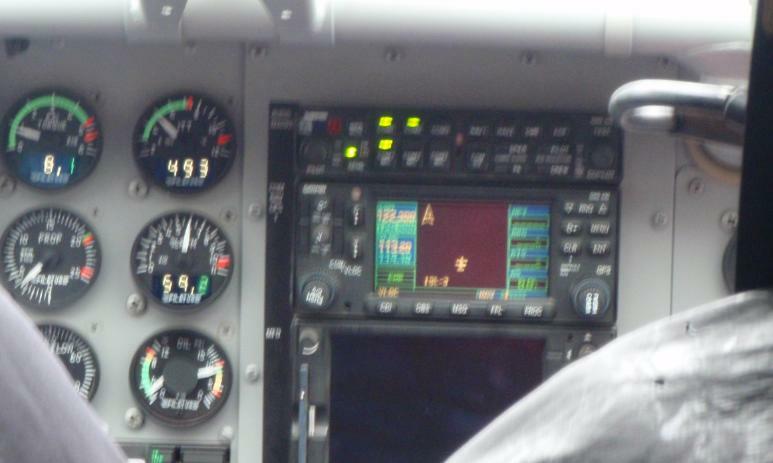 The plane that was on the runway now hits full throttle and flies down the runway and into the sky with us 50 feet away…. Huh? Oh, oh…hey I didn’t sign up for THIS!!?? But it was too late. They pull the tarp off one plane that had clearly not been in service, the pilot and co-pilot hop in, and the little single engine plane jump starts, while the bags get thrown in the back and we are poured into these tiny little seats (and mine pressing my body way forward past 90 degrees). I click my buckle, say a buddist prayer (because when in rome as it were :) and within seconds and I do mean SECONDS, the door closes, they give us our total flight instructions which consists of DO NOT TOUCH THIS HANDLE IN FLIGHT and BUT IN CASE OF EMERGENCY, PULL HANDLE BACK TO EXIT PLANE. I laugh at the irony that this is completely accurate information and completely useless as well because if A, then B, then C= a small mush mark on a Himalayan hilltop somewhere. He slams the engines into full throttle and uses the uphill slope to test the engine RPMs and oil pressure, spins the plane around at the top and before the plane has a chance to fully stop its turn, releases the wheel brake and we start down the launch pad with a roar. Now I have been on one more terrifying flight than this which is the stuff of legend, but OMFG, it was as if we were launching as the last plane out of Saigon and there was no second chances because the bombing was to begin. What on earth had been said between Katmandu and Lukla I do not know but the pilot/copilot were on a mission to deliver this cargo to Kathmandu NOW. I couldn’t figure out if we were running FROM something or TO something! We rocket down the airstrip, easily gain takeoff speed and leave the runway early. Steep climb and we were at least 2 miles from the airport before the outlines of the mountains came into view. Captain and copilot were on their radios the whole time, scanning the horizon for ground landmarks (remember, only visual flight rules for this flight) and climbing, climbing, climbing. Then the turbulence started. The plane spend quite some time buffeting and I pick my head up from the seat rest in front of me long enough to see the POWERED BY GARMIN GPS. OMFG redux….they are flying via a car GPS? Oh no, this can’t be good. Well, it was and then he switched modes and the Doppler radar shows up. Now I am not a pilot or do I know much about flying but I did recognize on the Doppler that there were ranges of green which I interpreted as low turbulence, yellow which I interpreted as moderate turbulence and a blood red that I interpreted as bad mojo. We wove at 18,000 feet through the green and yellow zone occasionally threading the needle between two red zones in a little patch of yellow. I put my head down at those moments because I knew that I wasn’t going to want to watch how the plane responded to those spots. Ugh….where is the pepto when you really need it. Barf bags, LOL…seatback pocket empty. Guess they got used up on the last flight. Over the first 30 mins of the 45 min flight, we see the snow covered peaks in the distance and for a brief second I wistfully realize this is probably the last time I will ever see the most grand mountains in the world. Right on cue, a hard jolt and bounce up and down with the pilot struggling to level the plane and that feeling was gone….nope…good bye roof….glad to have met you and even gladder to be homeward bound. As we get closer to Katmandu, the air settles significantly and we make a typically steep decent into KTM airport landing softly and smoothly and get out onto the warm tarmac (30 degrees+ from less than an hour ago) and realizing that some of the bags from us were on the other plane and some of the second flight passengers bags we had. We are transported by van back to our hotel, and the second group arriving only minutes behind but without 3 bags, mine being one of them. Two hours later, they arrive and all is well. This insane adventure is about to take a step into relax mode, with the finishing of this section of the blog and some shopping and bartering in Katmandu. Oh, yes. And I think I might have a beer. By some’s account I might even deserve one! Enjoy the last days photos…. After landing in Kathmandu, a quick view of our escape plane. 5 people and 9 bags = darn close to overloaded! Excuse me pilot, but are there drinks on this flight? Xanax despensers perhaps? 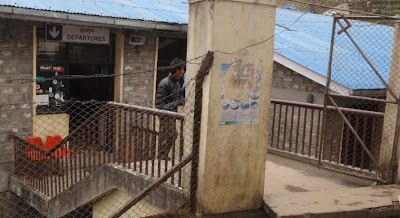 Entrance to Lukla Airport. Yack poop optional. A look down the runway view from our teahouse window at daybreak. 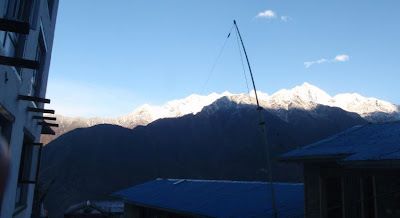 The view out our window at the teahouse at Lukla at 6am. A field of Garlic on the way back. 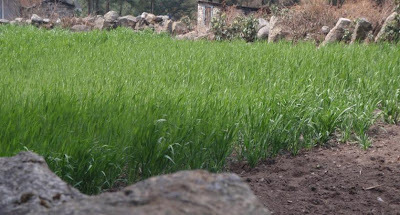 Garlic soup is very popular in Nepal and is said to help with acclimitizaton. A mere 175lbs on the back! 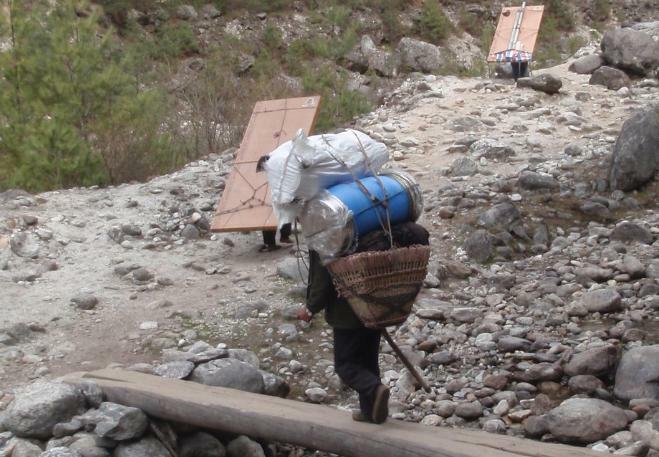 A picture so you can see what porters carry. To give you perspective, the plywood the two porters are carrying is 4" think . Go to your local hardware store and try to get 4" of plywood on your back, let alone carry it up and down a trail in altitude for days! They are AMAZING! Great blog Craig. Had a good laugh reading your escape from Lukla. Enjoyed reading all your Everest Blogs. Enjoy your beer, you earned it. Safe journey home. Hope weather will behave itself when my son Conor has to fly from Lukla to Katmandu in a few days. He just made the summit of Island Peak yesterday. Looking forward to his return home. Cheers. Please send Conner a big "high five" from me...that is AWESOME! When I saw the facebook post, it brought tears to my eyes because I know how hard it must have been for him to do it! He's a great guy and we all were honored to have him in the group. He is an inspiration! Thanks, Craig, for your kind words. Will definitely give Conor a "high five" from you. 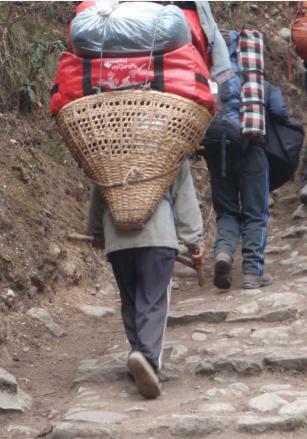 Spoke with him from Namche Bazar and he said it was an exhausting time, but well worth it. Now back in Katmandu since Friday April 15 enjoying a little R&R before his long flight home on Thursday April 21. We are all Looking forward to seeing him. Hope to read many more adventures from you. Take care.